Some 400,000 college students will accept diplomas this year while wearing gowns made entirely of plastic bottles. It's not a joke or a gimmick. It's a statement on how to keep trash out of landfills, said Jay Hertwig, VP of global branding for textile maker Unifi. Unifi, based in Greensboro, North Carolina, produces 300 million pounds of polyester and nylon yarn annually. "As a manufacturer, we asked ourselves what we could do to be more innovative and a socially responsible company," said Hertwig. Repreve was the answer. It's the firm's flagship fiber brand made from recycled materials. Unifi's Repreve recycling center is a 50,000 square foot facility in Yadkinville, North Carolina, where plastic bottles, fiber waste and fabric scraps get deposited. The company collects clear plastic bottles from processors around the country who first shred them into plastic flakes. 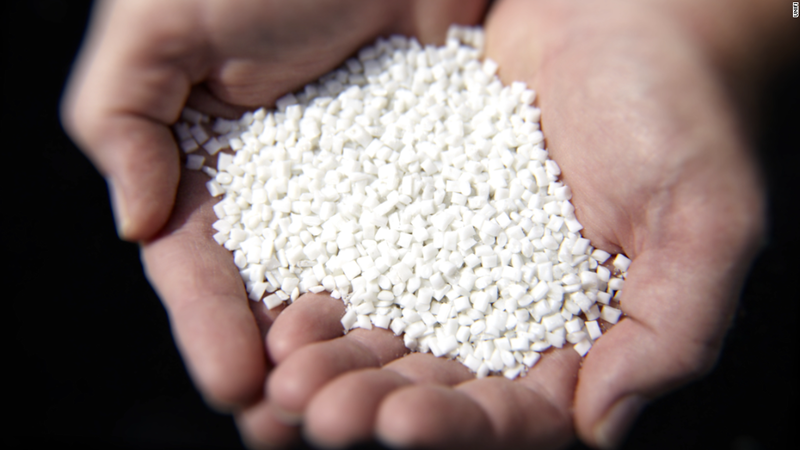 "We purchase these plastic flakes and convert them into small pellets," said Hertwig. The pellets are then melted, extruded and spun into polyester yarn. Repreve makes three types of recycled yarn: 100% from used plastic bottles, a hybrid of plastic bottles and fiber waste, and a hybrid of plastic bottles and used fabric. Since the brand launched in 2009, Hertwig said production has increased about 20% every year. Repreve yarn is used to make everything from jackets and T-shirts to dress pants and even car upholstery. It's used in brands like Patagonia, The North Face, Levi's, Adidas, Nike (NKE) and Ford (F). Another customer is Oak Hall Cap & Gown, which makes graduation gowns from the 100% Repreve yarn spun from plastic bottles. It takes 27 used bottles to make one gown, Hertwig said. He said more than 1,250 schools are using its Repreve-based graduation gowns, including Brown University, Michigan State, Yale, Notre Dame and University of North Carolina at Chapel Hill. "Schools want their campuses to embrace sustainability in terms of waste management, energy conservation and environmental protection," said Hertwig. "The gowns are a great way for them to spread that message, especially among millennials." The recycling center is currently able to produce 72 million pounds of Repreve fiber annually. Hertwig said they plan to increase production to about 100 million pounds by next year. 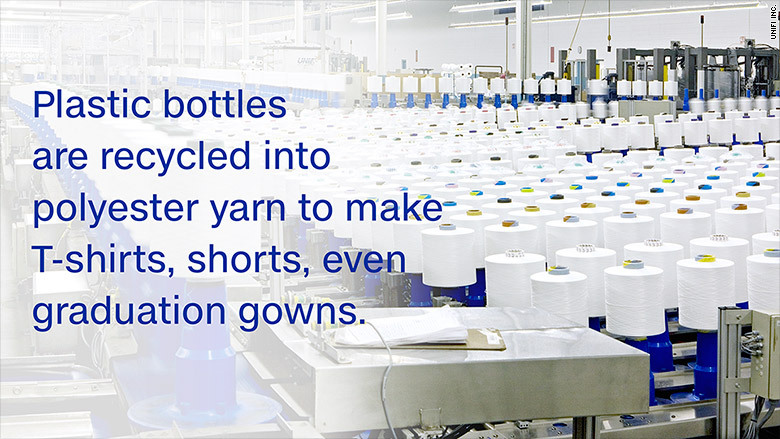 Unifi has turned 4 billion used plastic bottles into yarn in the last seven years. At the same time, there's an opportunity to recycle other plastic like food storage containers and plastic cutlery. "If it's made from PET, we can recycle it," said Hertwig. "This is all about educating consumers that high-quality products can be made from recycled waste."